Back in May, some members of our team attended the ARVO 2017 conference in Baltimore, MD. ARVO is The Association for Research in Vision and Ophthalmology and is the largest eye and vision research organization in the world, and the yearly conference is the largest gathering of those researchers and doctors. Our mission in attending this yearly conference is to identify promising research and researchers that we might want to support, learn about what’s new in macular degeneration research and assistive technology, and raise awareness with doctors about our organization and how we can help them help their patients with information. This year we had a bonus! We were there to see one of our supported researchers, Dr. Johanna Seddon, receive the Weisenfeld Award. Dr. Seddon of Tufts University School of Medicine and Tufts Medical Center was named the 2017 recipient of the Mildred Weisenfeld Award for Excellence in Ophthalmology for her pioneering work on the interplay of nutritional, environmental and genetic risk factors in age-related macular degeneration. 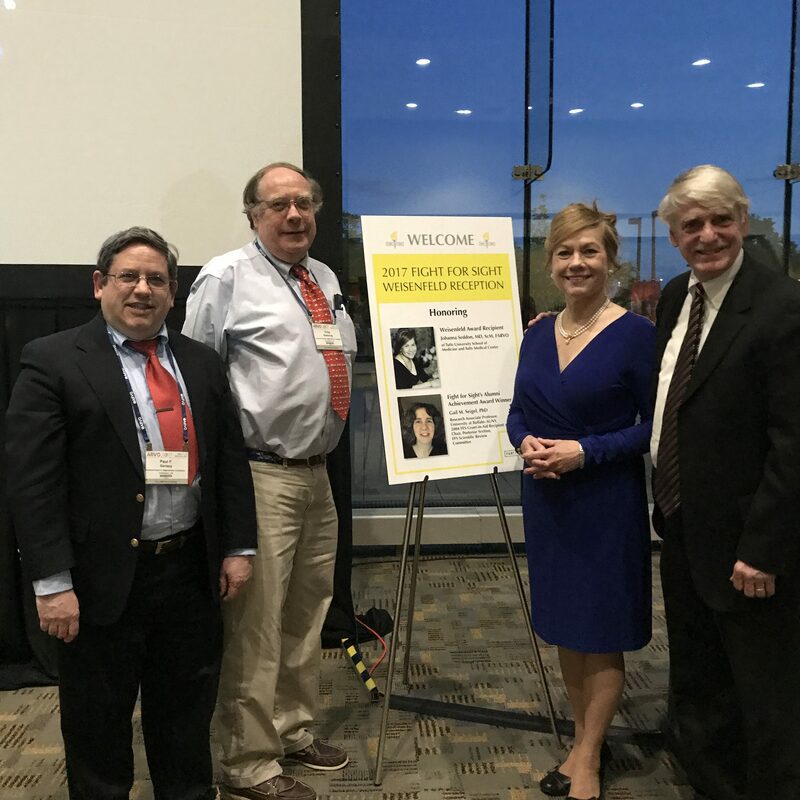 From left to right: Paul Gariepy (AMDF), Chip Goehring (President of AMDF), Dr. Johanna Seddon and her husband. Her studies of lifestyle factors have influenced clinical practice world-wide. Her discoveries of common and rare AMD genetic variants have provided targets for therapies. Her predictive modeling insights have laid the groundwork for personalized medicine. And some of you may recognize her from the Eat Right for Your Sight cookbook which was created in collaboration with Dr. Seddon. smoking increases risk of AMD, lutein and zeaxanthin (carotenoids) and dark green leafy vegetables in the diet reduce risk of AMD, omega-3 fatty acids, fish and nuts reduce risk, trans fats and abdominal obesity increase risk, and exercise reduces risk of macular degeneration; the development of comprehensive AMD risk prediction models and an on-line risk calculator. Her current work is focused on identifying genetic associations and interactions with non-genetic risk factors and sub-phenotypes of the disease. Is there anything that can be done now if you already have it. Yes, there are many things you can do! If you haven’t already, you can contact us for an information packet that will start you off with some good information regarding what you can do.